Cleveland Indians win 21 Straight! There is no joy on the Cuyahoga. We won't get to see Wild Thing square off against Mordecai Brown. My condolences to all you true and loyal Cleveland fans. I thought Indians had the ALDS in hand, but that's baseball. See ya next year, for sure! Once again, the %*#!^@! Yankees prove the value of an unlimited payroll. The players earned that win, so I'm not knocking them at all. And I have nothing but respect for Joe G, Starlin Castro, and Chappie - all ex-Cubs. But I choke on the prospect of the Yankees in the World Series. If it's any consolation, Yankees are down 2-0 in the LCS. Houston seems unstoppable, today's game may very well put the lid on NY's chance to advance. If Cubbies can defeat the Brooklyn Bums, they'll be in for one hell of a battle against these guys. To be honest, the odds don't look good. But that's sauce for the goose. We've been there before. I'm a Cubs fan - but not a troll. The tribe has been amazing, just like last season. Cubbies were left for dead this year, and somehow managed to recover and make the playoffs. They'll most likely clinch their division tonight. How 'bout that? Both the Indians and Cubs are on their way to round 2! I'm not sure if there's ever been a double-repeat in baseball history, but I'm quite sure it's very, very rare. Therefore, I'm pulling for the tribe to send those **bleep** Yankees back home and get to work against Houston. That's gonna be an enormous task - I think Tito and the boys are up to the challenge. On the flip side, Cubbies will have to face the Dodgers - an equally daunting prospect. Both teams have been there before, and have made the cut. Go Indians! Cubs and Indians in the World Series? I can't imagine a WS better than last year's, but that would surely qualify. Good luck - and keep believing! Best of luck to your Cubs! and looking forward to a big win over the Yankees!! Good for you and your Cubs! The Yankees are always tough but the Indians can do it. Best of luck to the Cubs! Looking forward to the face off 😀! Go Indians! 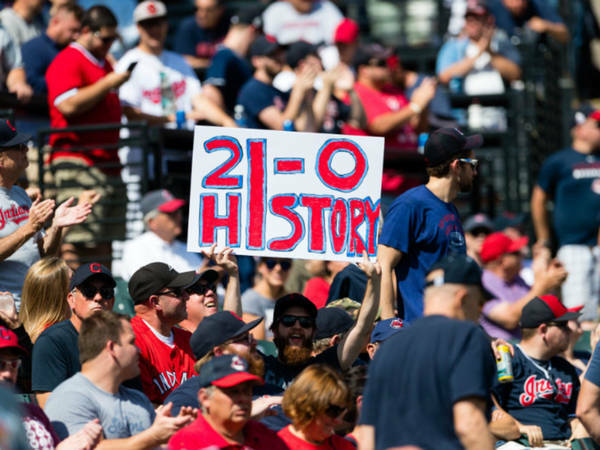 The Cleveland Indians now own the second longest winning streak in baseball history with their 22nd straight victory, surpassing the 1935 Chicago Cubs. Only the New York Giants can boast a longer winning streak in MLB history, having won 26 in a row in 1916. Re: Cleveland Indians win 21 Straight! I wish my dad was here to see it! Cleveland Indians Win 21 Straight, Longest Streak In AL History The Tribe are so hot even the sprinklers can't stop them. The team now has the most consecutive wins in more than 70 years. Literally in the bottom of the 5th inning the sprinklers went off. Yes and thanks for the link!